In 1951, when I was ten years old, my family moved to Japan for missionary work. We lived in the city of Mizuho, about three miles from Yokota Air Force Base. My parents sent me to the school on the Air Force base, and because they weren’t military people, paid tuition. I was the only non-military student there, which often made me feel shy, because I was different. One day when I was 12 years old, a dentist’s chair was moved into the school gym. All the kids in school had their teeth checked, one class at a time. When it came my turn, I obediently sat in the chair. 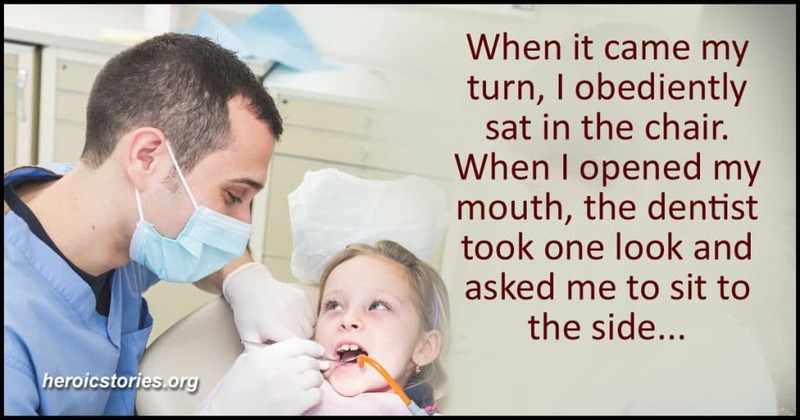 When I opened my mouth, the dentist took one look and asked me to sit to the side until he finished checking the rest of my class. He said he wanted to talk to me. I was apprehensive at being set to one side. I watched and waited until the dentist came over to talk to me. He was in his early thirties, wore a doctor’s jacket over his Air Force uniform and had a soft, kind smile on his face. He sat down beside me and quietly asked why I hadn’t seen a dentist on the base earlier. I explained our situation. He nodded in understanding and asked for my parents’ contact information so he could speak to them. I was nervous about having him speak to my parents. I knew he would tell my parents my teeth were in poor condition. I had already been to a local Japanese dentist who had put beautiful gold fillings in my teeth. Unfortunately, my mouth was full of decay and infection, including underneath the fillings. What a mess! The Air Force dentist obtained permission from his commanding officer to bring me into the base dental office after hours, where — on his own time — he would fix my teeth. The appointments began right away; there were 22 in all, two visits each week. The first appointments were surgical because I had some badly abscessed teeth. I remember being nervous sitting in that dentist’s chair the first day, white paper bib pinned in place, looking up at the lights. But the Air Force dentist was kind and gentle. He explained what he was going to do with such a calm demeanor that I felt calmer and trusted that he would take good care of me. I remember how kind and compassionate he was. It must not have been easy to bring my mouth back to health, nor to give up so much personal time. But he did. He saved my teeth, which I still have 55 years later! Those infections, if untreated, could have become life threatening. I wish I knew that dentist’s name. I would love to thank him for saving my teeth and possibly my life. Wow! That’s commitment and compassion at it’s finest. What a blessing.